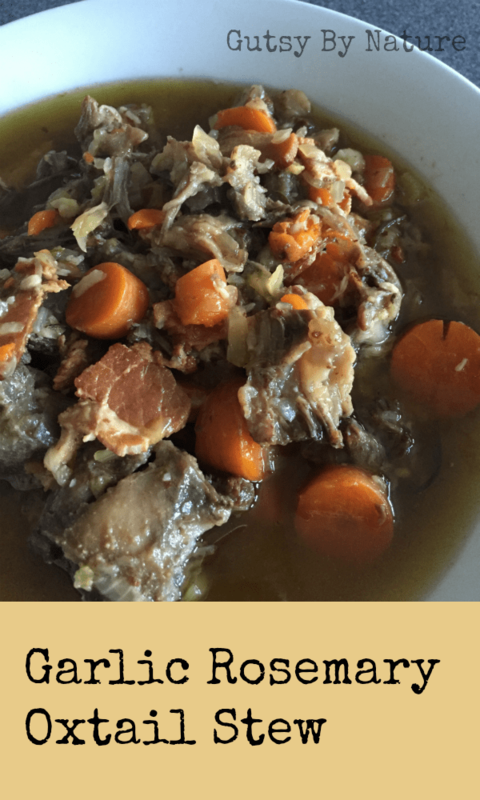 Way back in 2013, shortly after I started this blog, I created and shared a recipe for rosemary and garlic braised oxtail. I gushed about how delicious it was and what a great use of a cheap cut of beef it was, kicking off a series of posts I labeled “Grassfed on a Budget.” Well, I must have done a good job because from that day forward oxtail was suddenly nearly impossible to find. It was as if everyone in the entire mid-Atlantic region of the United States had seen my post and were now hoarding the grassfed oxtail stock! Finally I saw it listed on my local farmer’s buying club web page and promptly ordered two. And then we got deep into our summer heat wave and I had no desire to turn the oven on for even a quick roast, and certainly not for the three hour oven braise of my original recipe. Once again, the Instant Pot comes to the rescue! If you aren’t yet familiar with this glorious machine, it is a multi-function cooker that does the job of a slow cooker, electric pressure cooker, rice cooker, steamer, yogurt maker, sauté/browning pan, and warming pot. This recipe for oxtail stew makes use of the sauté and pressure cooker functions to transform a tough, but nutrient dense, cut of grassfed beef into a hearty bowl of unctuous meat and perfectly soft vegetables and aromatics in a broth that is delicious any time but will be especially nice as the weather shifts to cool fall temperatures. Serve in a bowl over a starch of your choice. I used white rice cooked in bone broth, but if your paleo template doesn’t include rice, you could serve with “cauli-rice” or sweet potatoes. Paleo Autoimmune Protocol (AIP): Generally speaking, alcohol is eliminated in the early phases of AIP. However, Sarah Ballantyne says that it is ok to include alcohol in dishes like this since most of it is cooked off. If you are not comfortable including it, simply use a cup of bone broth instead of the wine. Specific Carbohydrate Diet (SCD): This recipe is completely compliant with SCD as long as you use a very dry white wine and serve with a legal side dish like squash or cauli-rice. Low-FODMAP: Omit the onion and the garlic to make this dish low-FODMAP. You could use the green part of a leek and some garlic oil to approximate the flavor. 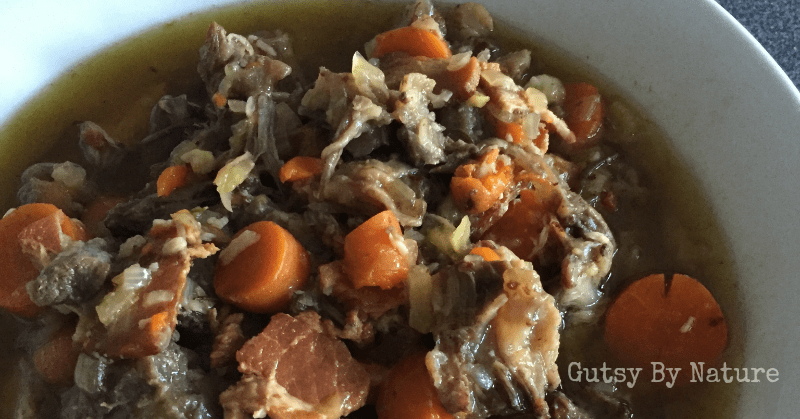 Use the pressure cooker function of an Instant Pot to transform this tough cut of meat into a nutrient dense stew without heating up your house. Press the "saute" button on your Instant Pot and allow it to get hot. Add the bacon and cook until fat is rendered and bacon pieces are crispy, stirring frequently. Remove bacon with a slotted spoon, leaving fat in pot. Season the oxtail with salt and then sear on all sides in the rendered bacon fat. Remove oxtail pieces and set aside with the bacon. Add carrots, celery, and onion to the pot and cook until slightly browned and softened, stirring the whole time. Add the garlic, rosemary, and bay leaves and cook just until aromatic. Add the wine and stir to deglaze the pan, scraping up any browned bits. Cook for 8-10 minutes, stirring frequently. Add the broth and stir. Return the oxtail pieces and bacon to the pot. Place lid on Instant Pot and seal closed. Press "cancel" to stop saute mode, then press the "manual" button and the + button until display registers 75. After cooking time is complete, allow pot to switch into "keep warm" mode and let pressure naturally release for 20 minutes. Manually release any remaining pressure and then open the lid. Remove bay leaves and rosemary stems and discard. Scoop oxtail pieces out and set aside to cool enough to handle, leaving the rest of the stew in the pot on "keep warm" mode. Using your hands, pull meat off the oxtail bones. Keep the bones for future broth making and return the meat to the pot and allow to come back up to temperature. Serve alone or with a starchy side dish of your choice. I just have a regular pressure cooker. What cook time do you suggest for this recipe? Thanks! I would try 60-70 minutes.